Want to give a classic grilled cheese a Tex-Mex twist? 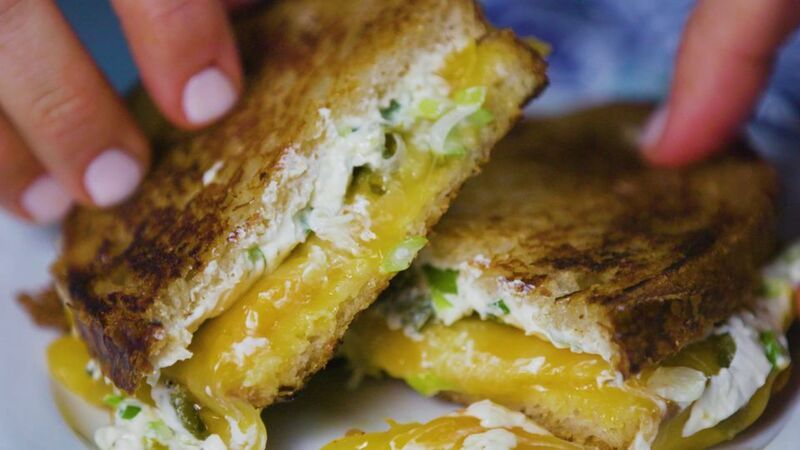 This recipe pairs spicy jalapeños and Colby Jack cheese with cream cheese and scallions to turn up the heat and take the gooey sandwich up a notch. Roast fresh jalapeños on a grill or burner of a gas stove top, charring all sides. Place the roasted jalapeños in a paper bag to steam and loosen the skin. With gloves still on, cut off the top of each pepper. Slice in half and remove the seeds. Now you can slice the remaining pepper into bite-size pieces. (Note: you can skip this step if you opt for the jarred jalapeños). In a bowl, mix the cream cheese, green onion, and some black pepper. Butter one side of each of the bread slices. Flip over the slices and on one, generously slather the cream cheese mixture. Top with the jalapeños and cheese. Close over with the other slice of bread, buttered side out. Place the pat of butter in a skillet and heat over medium high heat. Grill both sides until golden brown and cheese is melty.